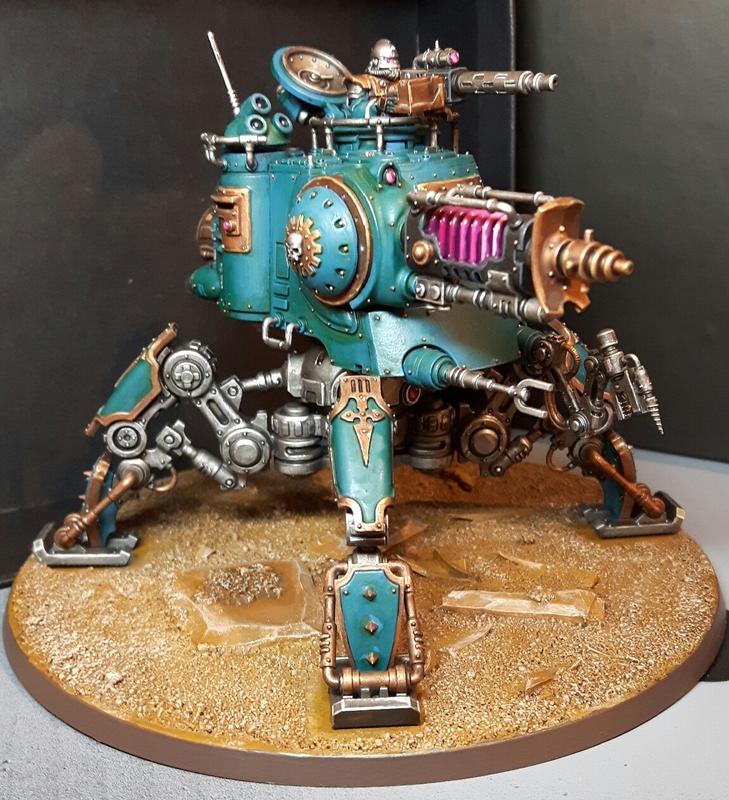 So, the end of the third week of Dreadtober looms, and how am I doing? Well, to put it bluntly, I've finished! Ok, that's not quite true, as I did say I would paint the other weapon options and I have yet to do so. But even so, the Onager itself is complete along with the Eradication Beamer I showed off last time. Painting the model in sub-assemblies really helped me to get it finished quickly and made the whole process a lot easier. It's much simpler to slap on a basecoat with a big brush when you don't have to worry about all those pesky details! Love the cog and skull motif. I think this is the first time I've applied a transfer since I was about twelve years old. I must say, transfers have definitely improved in the decades since then! I also used some Micro-Sol to help blend the transfer into the paintwork which worked quite well. How many lenses can you count? 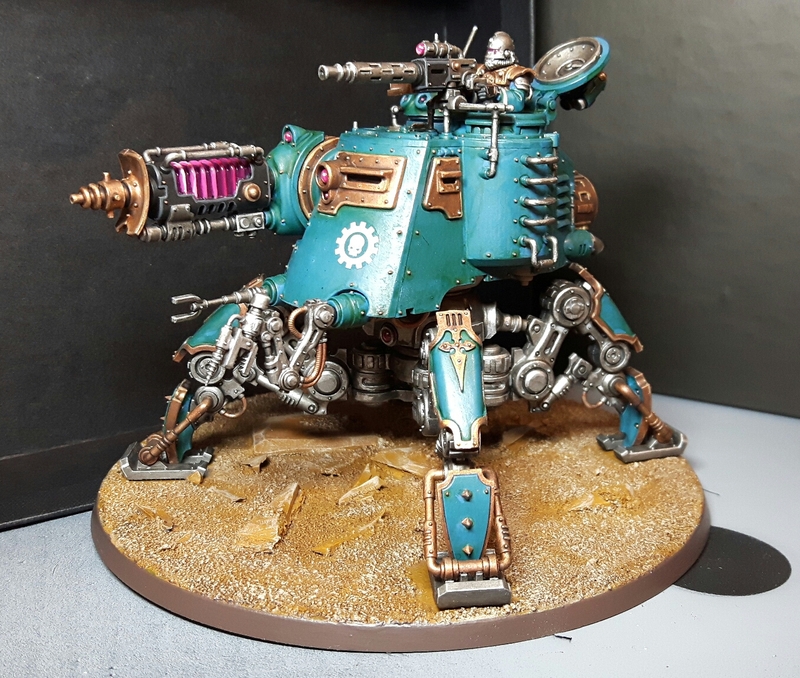 In case you can't tell from the rampant photography, I really am delighted with how the Onager turned out. The pink and green scheme scaled up really well to a larger model and the brass details really set it off. The most fiddly part was probably painting and assembling the turret gunner; but when you can have a heavy stubber for only five points, I wasn't going to leave him off! Feel free to count the rivets too! 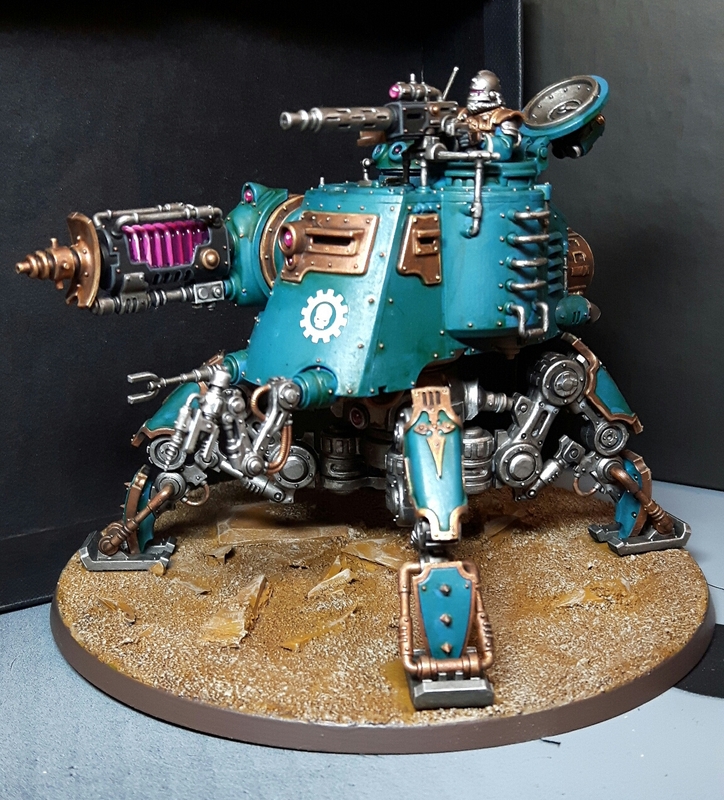 So, thanks to Todd and all my fellow Dreadtober-teers! Once again, the threat of community humiliation has spurred me on to complete a model that would probably have languished in indefinite undercoat. As I mentioned in my first Dreadtober post, I'm also participating in a build-and-paint campaign at the moment so I have a few other models on my list for this month. Check in next week to see if I have a further Dreadtober update or something different entirely! As usual, you can read my Dreadtober story here, here and here. Great stuff. Another cool mini ready for the battlefield. 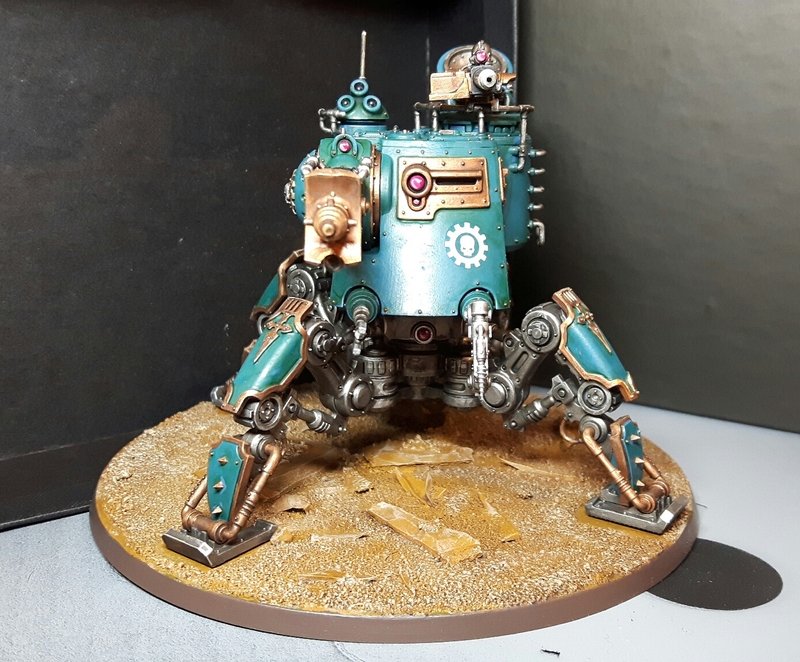 I wanted to have a go at Dreadtober myself, but I've been busy with other things. Maybe next year! Thanks man. I'm looking forward to chilling out this evening; taking a break from the crazy painting train! Also there's still time to join Dreadtober; smash out something for your Necrons in five minutes! Very cool; that piece came out quite well. Congrats! Thanks a lot! I'm very happy with the finished product. Great result! Generally I use/love muted palette,but your is popping a lot, and I really like it. I always think that miniatures need to be bright otherwise they get lost in the terrain. On the other hand, a more muted palette is often more realistic. Flippin love your scheme, and great pulsing purple rod ;) Congrats on finishing early, I'm behind schedule on mine! That's not the first time someone has admired my pulsing rod! 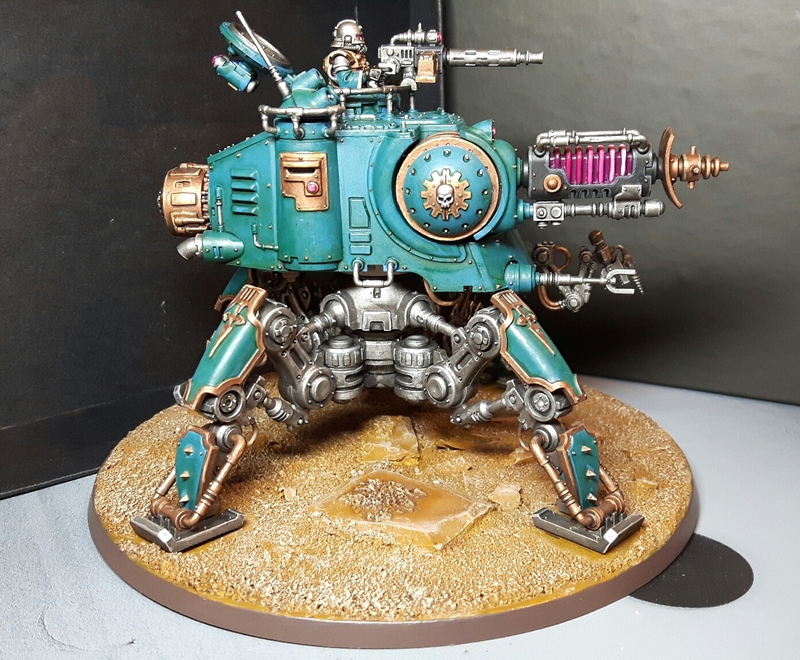 Great work on him Ed, I really the turquoise colors and the weapon's power source of purple really pops. Thanks a lot! I think the colours came out really well. Why do you put pictures like these on the internet? I don't have the $$ to buy one but looking at yours REALLY makes me want to!!! Sorry mate, next time I will post you hard copies! ;) When I get the alternate weapons painted I'll put up a few more photos.